By Lee W. Janson, Ph.D.,M.D. The author is uniquely qualified to explain the science that goes into making beer, which are simple chemical reactions. He is a home-brewer, certified beer judge and holds a doctorate in biological sciences and biochemistry. 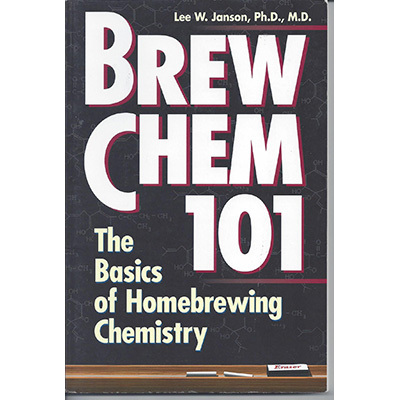 Brew Chem 101 is a book about beer chemistry written in non-technical language in a very readable style and with helpful diagrams,. As the author points out, any brewer can understand the basic details of the life of a yeast and what produces those annoying off-flavors. The chemical reactions at each stage of brewing are explained. Understanding what exactly is going on helps to avoid potential problems. Finally, the book concludes with a primer on beer tasting and judging. Steer away from common mistakes in taste, fermentation and alcohol content and use your newfound knowledge to successfully brew your most delicious beer yet.